""Questions the limits of previous critical approaches to the avant-garde . . . [and] displays a deep sensitivity for the political aesthetics of the Western avant-garde, particularly as those political aesthetics pertain to the institution of cultural criticism itself."" ""A provocative exploration of relations between the historical avant-garde and Cold War vanguard art and theatre. Sell's compelling historical and cultural narrative shows how the connections between the two exist at a very deep level of radical politics and aesthetics---an amazing concoction of rigorous scholarship, interdisciplinary learning, and progressive theorizing."" 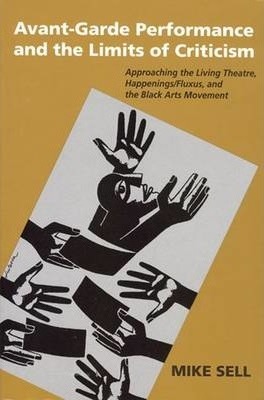 ""An important study that will raise the bar not only on scholarship of the Black Arts Movement, but on U.S. avant-gardism generally."" Avant-Garde Performance and the Limits of Criticism looks at the American avant-garde during the Cold War period, focusing on the interrelated questions of performance practices, cultural resistance, and the politics of criticism and scholarship in the U.S. counterculture. This groundbreaking book examines the role of the scholar and critic in the cultural struggles of radical artists and reveals how avant-garde performance identifies the very limits of critical consideration. It also explores the popularization of the avant-garde: how formerly subversive art is eventually discovered by the mass media, is gobbled up by the marketplace, and finds its way onto the syllabi of college and university courses. Avant-Garde Performance and the Limits of Criticism is a timely and significant book that will appeal to those interested in avant-garde literary criticism, theater history, and performance studies. Mike Sell is Associate Professor of English at Indiana University of Pennsylvania and editor of Ed Bullins: Twelve Plays and Selected Writings. Illustration: Poster design for the Living Theatre's production of Capital Changes (1998). (c) Luba Lukova.